It’s always exciting when scientists discover a new dinosaur, especially if it’s a cute little one. As Brian Switek reported in National Geographic’s Phenomena this week, paleontologists Anthony Fiorillo and Ronald Tykoski have named a smallish tyrannosaur that once lived in the Arctic. The scientists gave the dino the name Nanuqsaurus hoglundi –combining the Iñupiaq word for polar bear and a philanthropist named Forrest Hoglund. The incomplete skeleton unearthed in northern Alaska indicates that, although Nanuqsaurus was likely fairly closely related to Tyrannosaurus rex, it was much smaller, around 25 feet in length compared to 40 for a T. rex. Perhaps the most astonishing aspect of the recent discovery: photographic evidence (above) indicates that some traits of Nanuqsaurus may have somehow veered from their branch of the phylogenetic tree and taken up residence in cats, rather than birds. We await further study. Liek Dinos? Brian Switek’s ossim book, My Beloved Brontosaurus, is just out in paperback. You can haz. 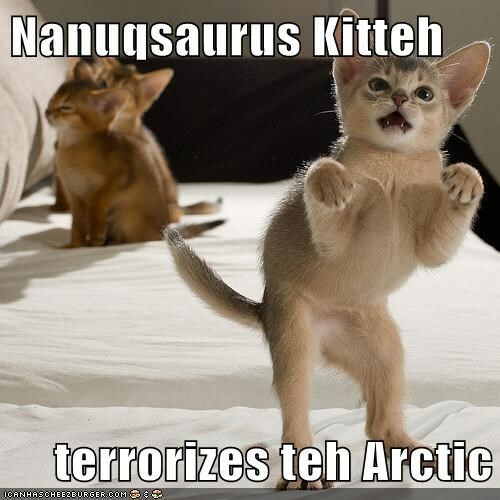 This entry was posted in Science Caturday, Uncategorized and tagged Brian Switek, dinosaur lolcat, Laelaps kitty, Nanuqsaurus hoglundi, science cat. Bookmark the permalink.